It seems that streaming music listeners fall into one of maybe two categories- the control freaks, who need to select every track that is played for them and prefer more micromanagable services like Grooveshark and the open-minded type that likes to be surprised by new songs or old favorites in their streaming queue, a feature mainly associated with Pandora. Spotify- which has gone over quite well with most segments of the streaming population in the US since its July launch- can now satisfy fans of the latter with the addition of a track-matching service similar to the one that was the initial hook for Pandora users when the service launched 2005. 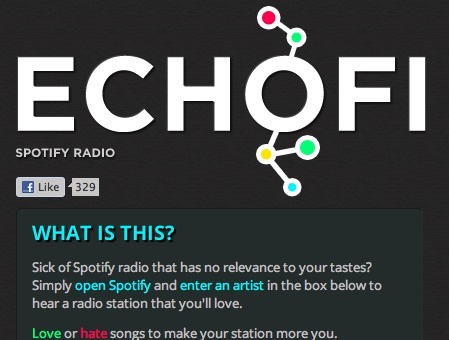 Called Echofi, the service prompts users to enter an artist on an external site to be matched up with music they’re likely to enjoy based on the selection. Although there are like and dislike options to mark undesirable suggestions, Echofi won’t remember your preferences betweens sessions, although that feature is reportedly in the works. The service also works off artist names and not song titles, giving it a little less matching-functionality than Pandora in that regard.